Long Lake in the Lakes Basin Recreation Area. At the beginning of June, I left for a week of hiking in the Sierra for my new book. 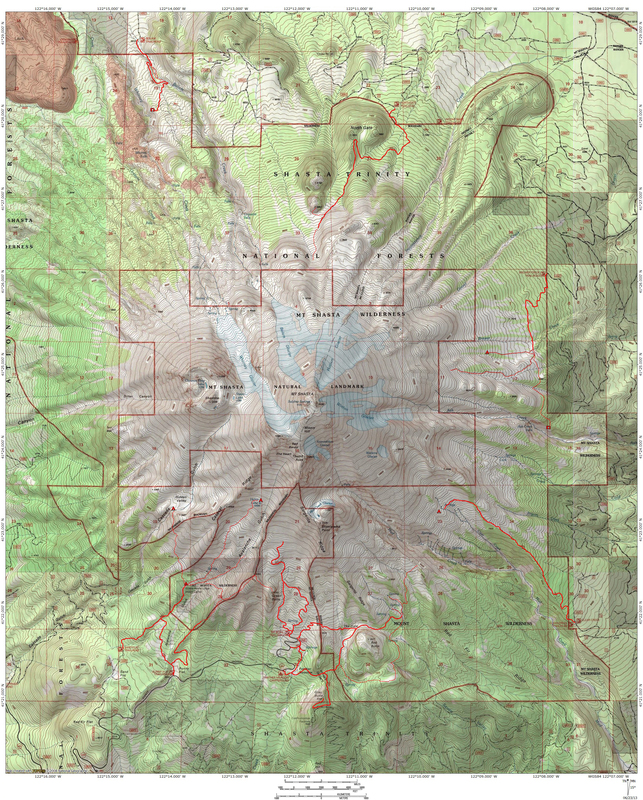 It was early enough that snow was still an issue at higher elevations so I had to string together a series of hikes that were low enough that I could GPS the trails without any trouble. The end result was a journey through California’s largest mountain range almost from top to bottom. I began in Sequoia National Park and ended in the Bucks Lake Wilderness, which is in the Feather River region, almost at the northern end of the range. I managed to get 10 trails completed, which will no doubt contribute to my success in terms of meeting my self-imposed deadline for getting the trails completed. It is hard to pick highlights when nearly every trail is simply awesome. Whether it is waterfalls or alpine lakes, massive canyons and cliffs or lush forests, the scale of the Sierra Nevada is one best described with superlatives. Surveying the impact of the drought on the range was both encouraging and discouraging. At the southern end of the range, the tree mortality was staggering, as almost all the conifers between about 4,000 and 5,500 feet have died. It is heartbreaking to drive through the mountains and seeing vast, dead forests. The tree mortality reached the southern edge of Yosemite, though it was obvious by that point that the effects were not as bad there and though some trees were casualties, their number was not great. North of Yosemite, there seemed to be no sign of any abnormal tree mortality. The encouraging part was the amount of snow I saw everywhere. It far exceeded the snow reports I had seen. Not only was there a lot of snow, but reservoirs that had not been full in years were overflowing. It isn’t just Shasta Lake that benefitted from a good winter. I still have a lot of trails to finish, but I feel better after having gotten a big chunk of them done! 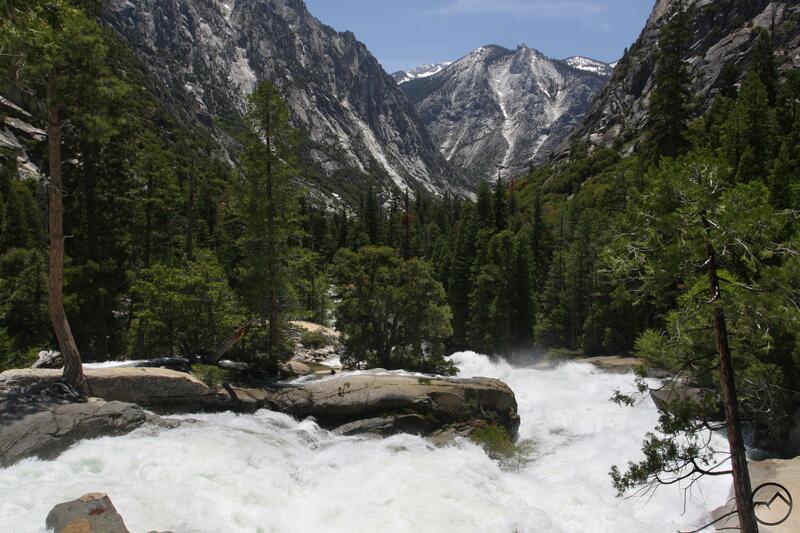 The first trail I completed was the hike to Mist Falls in Kings Canyon National Park. This magnificent hike is in many ways a counterpart to Yosemite’s famed Mist Trail. It certainly has the mist, the massive river and the steep granite cliffs. The Kings River was swollen by all the melting snow, which made it a fearsome sight. 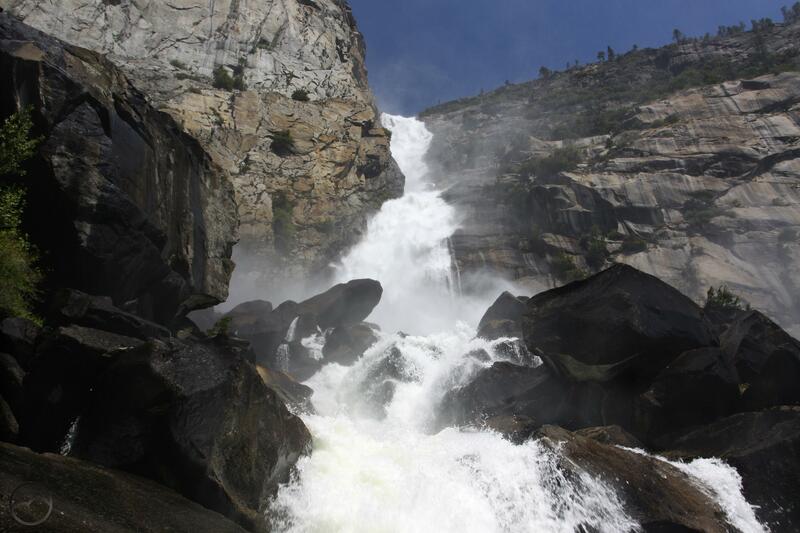 Mist Falls itself, a 50 cataract on the Kings River, was angry and powerful and beautiful. Whether hiking directly along the river or through forested benches with views of the soaring canyon, this trail was just right for starting off the Sierra adventure. The next hike was an easy one through Tokopah Valley in Sequoia National Park. The popular path follows the Marble Fork of the Kaweah River. Though the forest was initially dense enough to obscure the views of the valley, the river was delightful, cascading over numerous small waterfalls as it raced over large, rocky benches. The trail eventually emerged from the forest and the grand vista of the east end of Tokopah Valley was overwhelming. The granite cliffs soared 1,500 feet overhead and at the far end, where the canyon closed in, the Marble Fork raged 1,000 feet down the canyon walls. 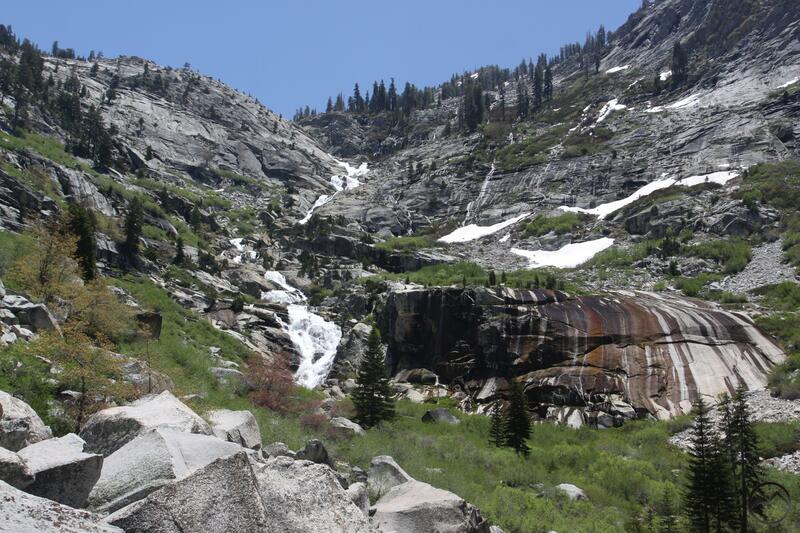 Named Tokopah Falls, this waterfall is the tallest in the Sequoia-Kings Canyon area. It certainly is spectacular. The next day I managed to get two trails done. 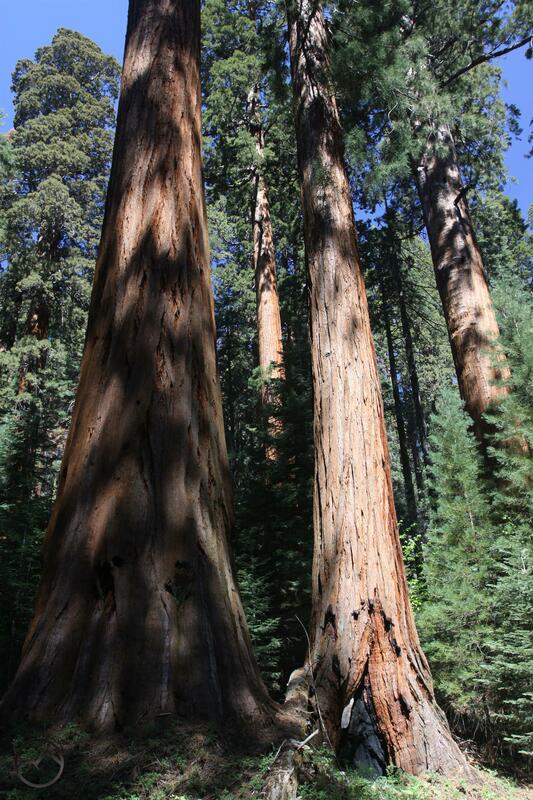 The first was in Kings Canyon’s Redwood Mountain area. This trail passes through the largest unbroken grove of Giant Sequoias in California (which obviously means the world, since they are only in California). The massive trees lined the trail for mile after mile, each one seemingly more impressive than the next. While there are none as large as the great General Trees (Grant and Sherman), this grove is essentially in a wilderness setting with no crowds. Indeed, there are few hikers here at all and the silence of the trees was incredible. Afterward, I spent the afternoon hiking up to Weaver Lake, a beautiful alpine lake beneath a granite cliff. Located at the terminus of the Great Western Divide, this small lake is an easy hike and a great introduction to the terrain of the Divide. 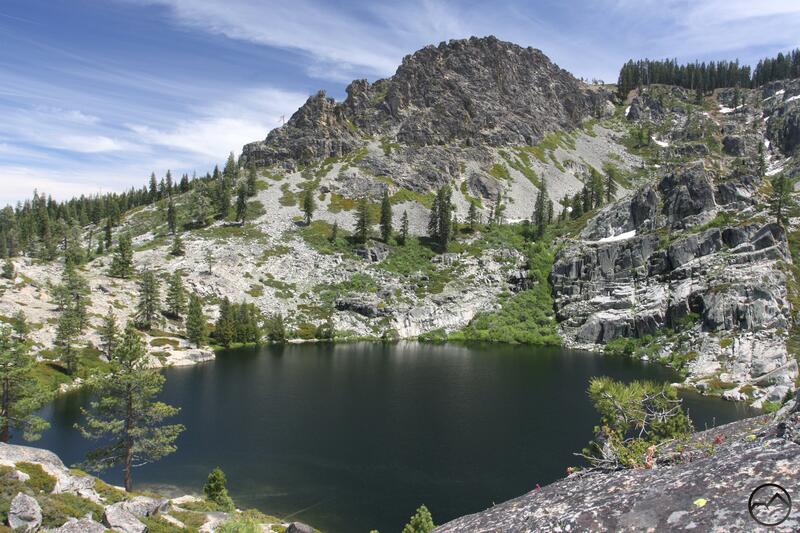 It is found in the Jennie Lakes Wilderness, a small body of wild land tucked away between Sequoia and Kings Canyon National Parks. Along the way to the lake there are numerous creek crossings, boulder fields and views of distant Sierra peaks that are in the 12,000 and 13,000 foot range. After leaving the Sequoia-Kings Canyon area I headed north to Yosemite. While there, I hiked the trail along the north shore of the Hetch Hetchy Reservoir. Although the lake can be discouraging by its mere presence, it is still a spectacular area. This was made all the more so by the high water in the valley’s waterfalls. Slender Tueeulala Falls had very strong flow, forestalling its eventual drying up by several months. Wapama Falls was simply incredible. The waterfall is surely the most underrated of all of Yosemite’s waterfalls. Nearly 1,000 feet high, it has a massive volume of water. It pours off the mountain in two tiers before exploding on a vast talus slope composed of house-sized boulders. It splits into several large channels as it pours through the rocks. I was soaked as I crossed the network of bridges that traverse the talus field. I then headed north to Lake Tahoe as I notched more trails low enough not to have a lot of snow on them. 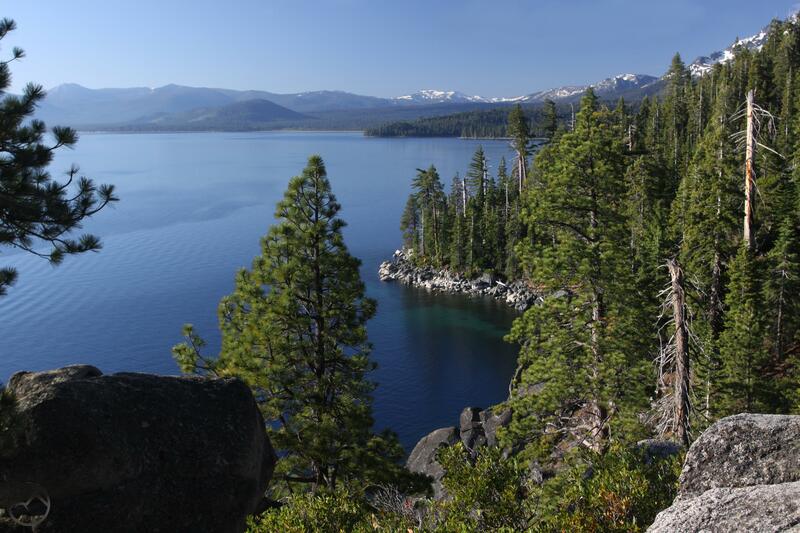 Lake Tahoe’s Rubicon Trail certainly fit that bill. This gorgeous trail follows 5 miles of the lake’s shoreline through what is essentially a wilderness setting. There are far-reaching views across the lake, neat trail-routing along granite cliffs, and great vistas of snowcapped peaks. The trail ends at scenic Vikingsholm, where a short trail leads up to Eagle Falls, a great conclusion to a spectacular hike. Next up was a trip into the Granite Chief Wilderness. The hike up to Five Lakes had a stiff climb but that was ameliorated by the beautiful scenery. 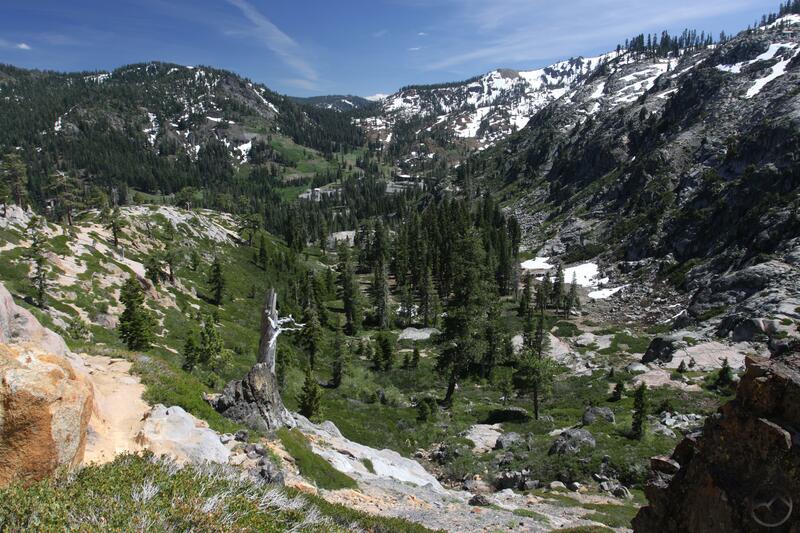 Located on a divide between Squaw Valley and Alpine Meadows ski areas, the trail climbs through a variety of different rock types. They created a colorful scene with red granite smashed up a against gray granite and black intrusions of volcanic rock punctuating the scene. The Fives Lake were partially snowbound, but still accessible. They certainly were scenic and made a great destination on a hot day. After racking up two hikes in the Lake Tahoe area, I raced up to Feather River Country. As the sun began to set, I quickly hiked the short, easy trail to Frazier Falls. 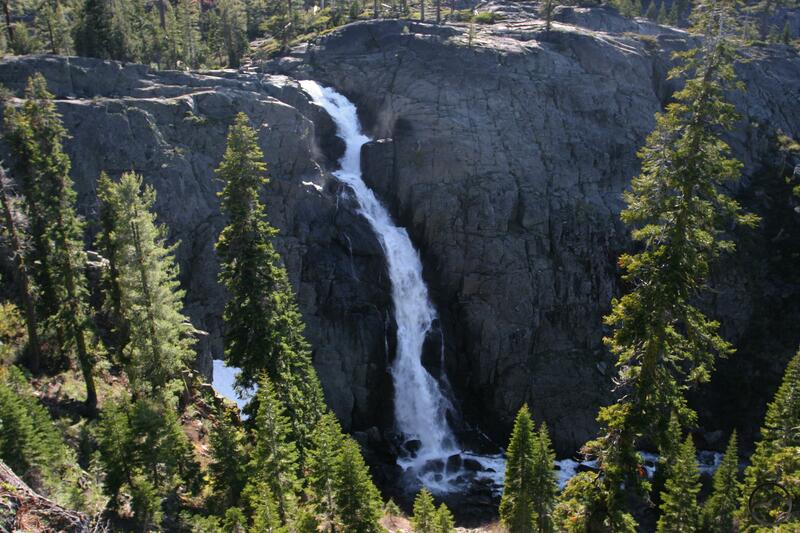 This impressive waterfall is 176 feet high and is among the prettier waterfalls in the area. The falls pours over the lip of the cliff and then cascades to the ground in a few, nearly indistinguishable tiers. The trail is short and accessible to wheelchairs. The hike passes through pine and fir forest, through rocky gullies and even has a nice complement of aspen trees. I want the book to include trails with a range of difficulties and this one may just rate as the easiest, but it by no means lacks great scenery. The last day of my trip saw two more hikes completed. 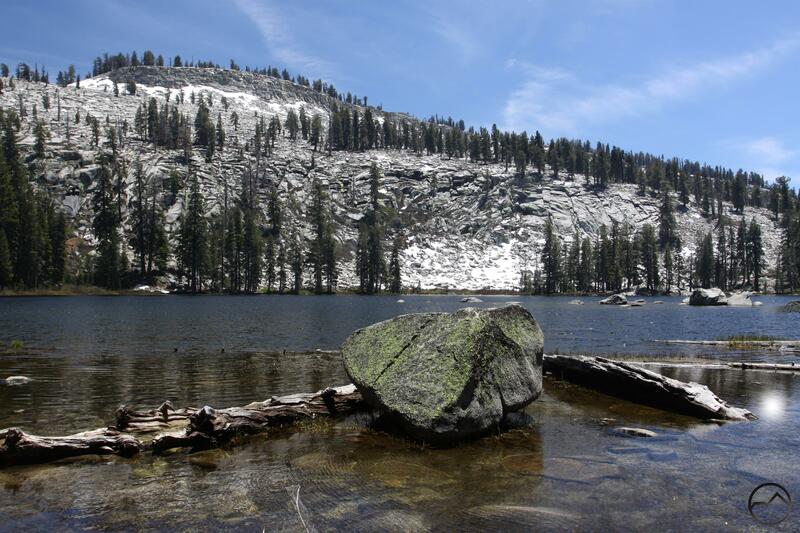 The first was at the magnificent Lakes Basin Recreation Area. 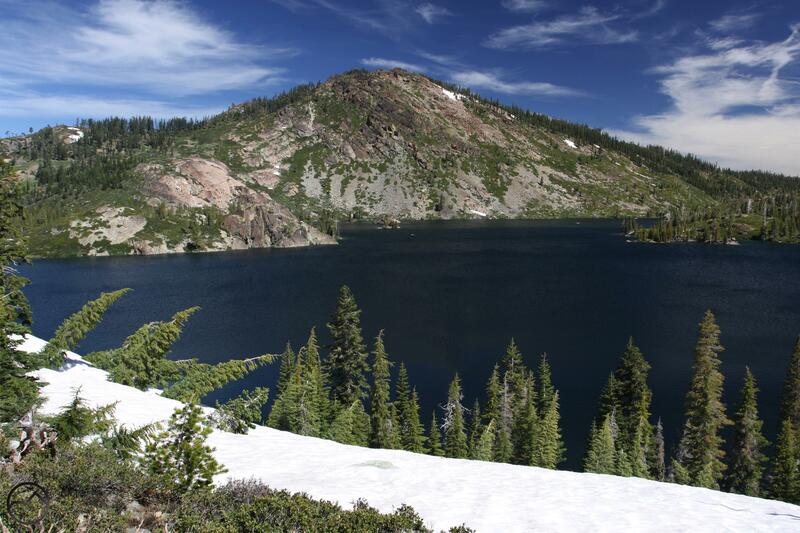 This stupendous area has, as its name implies, a number of alpine lakes. There is a well-developed trail network here, accessing numerous scenic areas. The loop I choose circled Long Lake, one of the largest in the basin, but also passed by 8 other alpine lakes. The rocky basin was perfect for hiking and the lakes were complemented with meadows, waterfalls and views of the surrounding mountains. This area is not unknown but it still seems like a bit of a sleeper, with a lot more to offer than one might expect from an area this far north. The last hike, as I noted, was through the Bucks Lake Wilderness, from Silver Lake to Gold Lake. 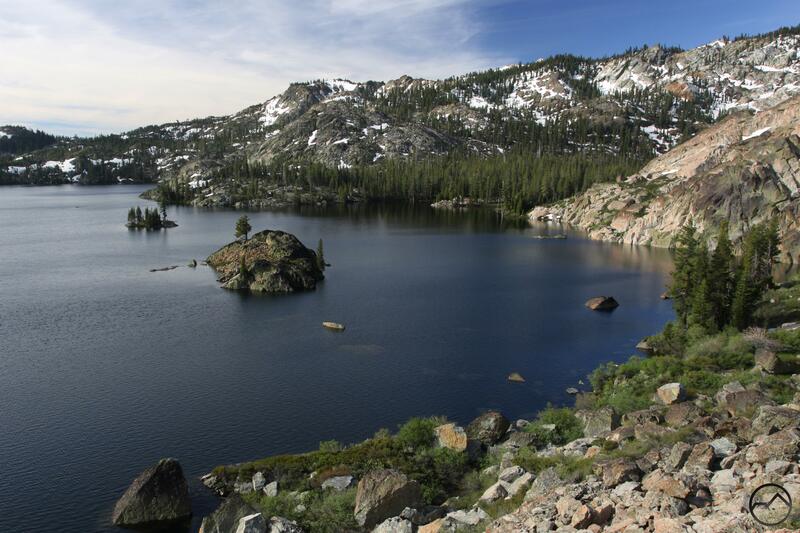 This is the Sierra’s last big gasp of granite high country. Not too well known, it offers plenty of solitude to go along with the gorgeous scenery. The views from the trail include Lassen Peak and the Sierra Buttes as well as constantly changing perspectives of the massive granite cirque basin that contains Gold Lake. Once the trail arrives at the lake, one is in alpine heaven, with steep rocky cliffs, cascading streams flowing into the lake and the dark, brooding mass of Spanish Peak looming overhead. It was a great end to a great trip. Your personal choice of descriptive terms were wonderful and it seemed like an adventure story needing to be taken…or at least to read about (if one is not a mountain trekker). Cannot wait to read about all of it in your book! This looks like an amazing time! Wow. I’m excited about doing just a couple of trails in Sequoia and Kings this fall. Can’t imagine doing all of these in one trip! You’ve certainly found a great hobby that you even get paid for! Well done.